German qualified Physiotherapist (1997), Myoreflex Therapist (2000), Myoreflex Therapist Instructor (2002) and Naturopath or “Heilpraktiker” (2004). 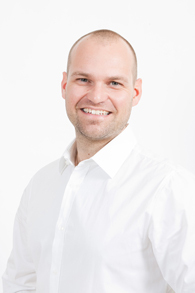 Hagen Stroh has consistently taken more Continuing Professional Development Courses and has studied a variety of treatment and therapeutic techniques, including: osteopathy, Myoreflex Therapy and most recently LOGA Therapy which focuses on Performance optimisation, brain & endurance for professional athletes, incl.nutritional advice. Since the start of 2011 he has been self employed, working closely with many athletes including soccer players from Real Madrid, WestHam United, Bayern Munich and Sporting Lisbon as well athletes involved in tennis, skiing, athletics and handball. In summer 2011, he opened the doors to myoreflex in Greystones, the first practice of its kind in Ireland to offer Myoreflex Therapy. This therapy is not only relevant to athletes but also to people suffering for example from back pain, neck pain, migraine, tinnitus and pregnant women. Both young and old have benefitted from Hagen's treatments. Jill Collins qualified as a Sports Therapist and Personal trainer in 2010. She gained experience working with players from Pembroke Wanderers Hockey Club and by subsequently setting up her own mobile clinic. She has a keen interest in sports participation herself and is captain of PWHC 1st team in the Ladies Leinster Senior League Division 1. Jill discovered Myoreflex in 2012 and commenced an intensive study programme in Hamburg, Germany whilst working along side Hagen in the practice. She fully qualified as a Myoreflex Therapist in November 2013.